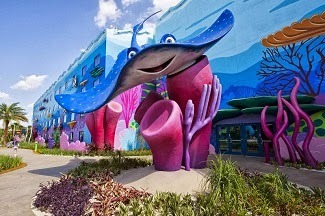 Disney's Art of Animation Resort is the latest addition to the value resorts but it really sits in a class all it's own. This is truly a magical place where a child's perspective is the number one priority. 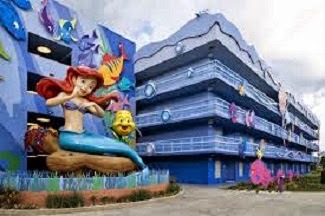 As the name suggests, this resort celebrates animation and focuses on four beloved movies: Finding Nemo, Cars, The Lion King and The Little Mermaid. It begins when you enter the main lobby where one wall is covered with black and white sketches from the four movies and the other is lit up with the colors of an artist's palette. As you walk through the lobby into the open air, you are first struck by the incredible Big Blue Pool, themed obviously after Finding Nemo. There are grand sculptures and fun squirting play areas and you can even listen to some great tunes while you swim under water! To the right is the Cars building. Any fan of this movie will love walking along Route 66 as they make their way to their room. This area also has a second smaller pool which features giant road cones to lounge in. To the left is The Lion King building. Incredible sculptures make this area very magical and very photogenic. Unfortunately, this area beckons to be climbed on but the signs tell us this is a no no. All three of these sections provide only Family Suites that sleep up to 6 guests. They include a master bedroom with it's own bathroom, a dining/living room area and a second bathroom. The table and chairs is actually what's called an Inovabed which pulls down into a bed that sleeps one adult or two small kids. The sofa converts to a pull out double bed. There is also a mini-kitchen which includes a microwave, coffee-maker, sink and small refrigerator. Walking through the Lion King section you will come to the furthest section from the main lobby, The Little Mermaid buildings. These house regular value rooms with two double beds that accommodate up to four people. Again, there is another well-themed pool where everyone can feel like a mermaid... or merman! These rooms are very popular not only because of the theming, but also because they are comparable in cost to the other value resorts while the family suites can run you more than the rooms at a moderate resort. Overall, this resort is completely magical for any fan of these Disney movies (and who isn't a fan?!). Young and old will enjoy the whimsical iconic statues and there is no shortage of Disney magic. 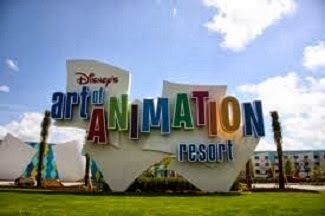 The one downside that may prove to be an issue for some adults in particular is the fact that this resort celebrates animation and is very child focused which translates to the colors in the rooms are very saturated and bright and can be busy. If you are looking for muted more sophisticated tones to calm yourself after a long day in the parks, this might not be the best choice for you. On the upside, it is compact enough where you feel like you can easily visit and enjoy all four sections. The food court, The Landscape of Favors, offers great selections for breakfast, lunch and dinner with something for everyone. Like all Disney resorts, it has the standard gift shop and arcade plus it has a single bus stop for convenient transportation to the parks. 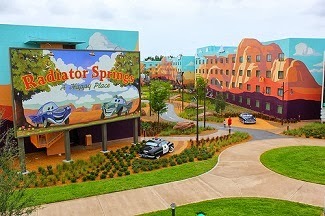 This resort was originally intended as the second half of Pop Century but was re-themed before it began construction. It is a walk over the Generation Gap bridge to the Pop Century Resort but please note, there is no pool hopping between resorts. Disney definitely brought the magic to this resort. It is fun and I'm sure every child would love to stay in any of the four building sections. 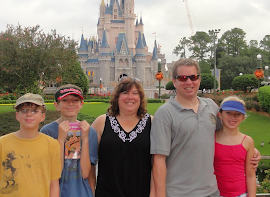 Contact me today to see if this resort is right for your family's next stay in Disney World!! Two discounts have been released for Disney World - Play, Stay, Dine and Save offer, and a Winter Offer for room discounts. Disney only allows you to use one discount at a time, but I will check all options to get you the best possible deal! Please note, this is NOT a normal package discount like free dining, kids stay and play free or any other offer. There doesn’t appear to be anything included for free, just a discount on the package. We have been finding that for some date and resort combinations, one discount can work out much better than the other. This discount appears to excludes the Little Mermaid and Family Suite rooms at Art of Animation, 3 bedroom villas, Villas at the Grand Floridian, Deluxe resort suites and the campsites at Disney’s Fort Wilderness. As long as you check in by March 5, 2014, you will receive the discount for your entire stay, based on availability. Special room only discounts for select travel dates from January 5 to April 12, 2014. You must check in during the travel dates in order to receive the discount, however, you can extend your stay past April 12, 2014. Only the nights included in the travel dates will be discounted. You cannot check in before January 5, 2014 and receive a discount. Availability is limited, and not all resorts and room types are available. Some nights may not be discounted, and weekend prices may be slightly higher. Minimum stay requirements may apply for Friday or Saturday arrivals. If the resort you are interested in is not listed above, it still may be included in the discount for some dates, or at a lesser discount. Nights between March 6 – 13, 2014 may not be included in the discount, or may be discounted at a lesser rate. Contact me to see how I can save on your family’s magical vacation! !